Although its purists and ardent admirers may beg to differ, silent cinema is a hard entity to bring alive, given that its last true films were made almost 80 years ago. It is still more difficult to take what could be written and to distil it into what should be written to capture the interest of both casual reader and cinematic enthusiast. In his simply-titled book Silent Cinema however, Brian J. Robb has achieved both these objectives. 12 chapters help to comprise 149 pages of illustrated text followed by a useful “grab bag” of handy resources, notes and an index. Given the sheer scale of silent film production selecting the sufficient balance of general facts and academia is not an easy one, but Robb ensures the reader is quickly engaged with a swift discussion of the origins of cinema per se which includes a superb engraved picture of a Praxinoscope at work (p.7). Refreshingly, as well as focusing in on the much-discussed first Lumiere film show on 28th December 1895, Robb gives due credit to others who played a part in the development of the medium (such as Louis Le Prince and William Friese-Greene), often omitted from histories of this period. Then, after a chapter about the cinema as a ‘developing art’, Robb sensibly abandons a strictly chronological approach in favour of a focus on specific influential individuals who worked throughout many years of the silent era. Starting with Georges Melies (and giving that gentleman due credit, again making a pleasant change from those who seek to dismiss him as a mere trick film maker with an airy wave of the hand), Robb then moves on to discuss directors, ‘dramatic stars’ and ‘silent clowns’ in a tripartite section of chapters that forms the core of his book. The chapter dealing with ‘dramatic stars’ is additionally interesting because, conversely, of the inclusion of an unnecessary piece of “dumbing down”- a comparison to contemporary stars. Presumably placed there as a helpful guide for the youthful 21st Century cineaste, the inclusion of the ‘contemporary equivalent’ line undermines some of the useful work within the mini biographies without any obvious merit. Thus, William S. Hart and Tom Mix are still present in modern-day cinema apparently…in the form of Bruce Willis; and the multi-faceted Lillian Gish becomes the rather less faceted Gwyneth Paltrow. Given the choice, I am sceptical whether Griffith would have cast Paltrow in Way Down East- but then again Griffith himself probably has a modern equivalent, although this (wisely) isn’t speculated upon. Perhaps the luckiest star of all is Valentino- he is (again apparently) the equivalent of no less than four contemporary actors at varying stages of their careers. This chapter is followed by one on silent screen comedians, which thoroughly deals with the major players and pleasingly includes reference to Harry Langdon, again an often-overlooked figure. Two comedians who are largely omitted from this section are, surprisingly, Stan Laurel and Oliver Hardy, although they are mentioned at odd stages throughout the book as a whole. The first 105 pages of Silent Cinema conclude with a fascinating chapter about Hollywood scandals (an integral part of silent film history) and a brief survey of international film production during the silent era. It is a chapter such as this which really marks the success of Robb’s book, for it provides some detail rather than none, yet can be used in conjunction with other sources to make further research a distinctly practical possibility. This chapter leads on to a chronological discussion of 29 key silent films which neatly encapsulates several genres, styles and talents, a clear example of the sheer diversity of silent film production. With some notes about the advent of sound the book’s narrative closes, what follows being a useful section of resources plus notes and an index. Overall, Brian J. Robb has done an excellent job in making the topic of silent cinema not only accessible but very readable. His book is a nice “sociable” size, well packaged with foldback card covers, and contains an appropriate amount of good quality illustrations. Complimenting this, the lively way in which the information is presented and compressed into a neat volume should make it an ideal instant reference book for any film fan, whatever the state of their cinema library. Despite this, I feel the book will most appeal to those who wish to educate others in the joys of silent cinema- as an affordable present for a youngster interested in cinema history it presents a highly interesting and well-written narrative much like the films discussed within its pages. An additional plus to this particular publication is the inclusion of a DVD from Sunrise Silents, whose enthusiastic commitment to the pre-sound era is both inspiring and gratifying. Conveniently chaptered, the three hour DVD acts as a showcase of 27 performers from the silent era ranging from Buster Keaton to Lon Chaney, Colleen Moore to Rin Tin Tin. Beautifully tinted and carefully selected to show the range and variety of silent filmmaking, the only downside is the absence of film titles, directors and dates on the disc itself, which would have made tracking down some of these films that much easier. However, the simple presence of the DVD itself is indicative of the care and attention that has gone into Silent Cinema, which is most certainly a worthy addition to any serious film library. 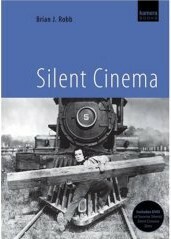 'Silent Cinema' is published by Kamera Books.